The function principle of our continuous casting machines is based on similar ideas as our vacuum pressure casting machines. Instead of filling the liquid material into a flask you can produce (draw) sheet, wire or tube by using a graphite die. Therefore we use a die cooler that cools down the material below solidification point. The so called drawing unit consists of a microprocessor controlled motor that pulls out liquid material in program- mable steps. The drawing time, the stop time and the optional reverse time are variable. All this happens without any air bubbles or shrinking porosity. The optional tools like hydraulic cutters, bending units or coiling systems proof the versatility of the machine, and material can be produced on demand. All continuous casting machines operate on a lower frequency than usual on the market. 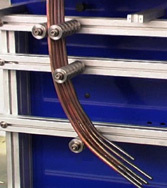 This low frequency leads to a very high penetration of the electromagnetic field in the liquid melt. This physical effect called mixing or stirring effect prevents a sedimentation of materials with a higher specific weight e.g. gold in the liquid bath. The material is in most of the cases homogeneous up to 10th of a thousandth. The low frequency of our continuous casting machines guarantees an intensive mixing of the molten material. This is the best basis for homogeneous alloys. In difference to many other systems, at the INDUTHERM continuous casting machines the crucible is closed by a stopper rod. That means, that no metal can flow out before all material in the crucible is completely molten and mixed. Your alloys will always be absolutly homogenous. 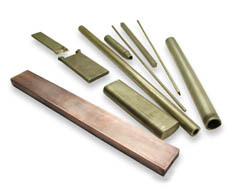 So it’s possible to work with pre-alloys or with pure metals without any risk. With the new sintering kit, up to 6 rings can be sintered at the same time. The processing time including setting and removal takes 6 to 7 minutes. Pressure and temperature (a little bit below the melting point) can be regulated precisely to the requested data. 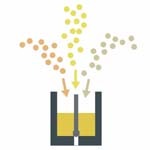 In many test cycles this way of sintering has been optimized. 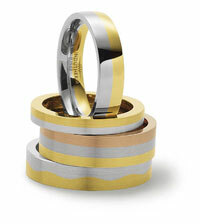 The items to be tested, rings in different metal combinations, were checked thoroughly at wedding ring manufacturer E. Schwarz GmbH in Pforzheim. The sintered rings were widened up to 18 numbers, partially milled and then cut to control the quality of the welding under the microscope. According to E. Schwarz, the results were absolutely convincing in the case of low and high carat combinations as well as in the case of Pt/ 18 ct Au.